While you’re in the midst of finals and term papers, it’s hard to see past graduating college. It may feel like once you’ve passed all of your exams and received your degree, the hard part is over. However, this is unfortunately not always the case. Most people are in college and pushing themselves to succeed with one goal in mind – getting their foot on the career ladder and landing their dream job. This means that the work doesn’t end once you’ve graduated, it’s time to start working on an unbeatable cover letter and CV. No matter how good your grades are, if your cover letter is sub-par, you’ll struggle to even get through the door for most businesses. However, fortunately, there are some online resources that can help your application stand out from the crowd for all the right reasons. One of the quickest ways to send your application straight into the trashcan is to make spelling and grammar mistakes. You can easily avoid this by using websites such as the Hemingway App, which check your grammar and advise you on how to re-phrase your sentences to make sure they are as powerful as possible. This makes your cover letter clear and easy for your employer to read and remember. Bear in mind the specific requirements your employer may have set, for example monitoring your word count with Easy Word Count. This is important, as you will appear very sloppy if you don’t adhere to limits your employer sets. Consider the job you are applying for, and how academic your application should be. Don’t make something too simple or complicated for the position you’re applying for, and monitor how difficult the language you use is with Readability Score. If you are writing a detailed cover letter and need to use references, then Cite It In or Essayroo can make sure you are referencing correctly. By using these resources, you can ensure that you at least meet the minimum requirements of having good spelling and grammar, clear sentence structure, and the appropriate language level for the job you’re applying for. Even if your employer doesn’t set a specific word count, keeping an eye on how much you are writing will help you write the appropriate amount for a cover letter – not so long as to be too much effort for a busy HR manager, nor so short that you seem lazy. While the above tools are helpful to any writing task you need to do, there are also resources that are entirely aimed towards writing cover letters. These resources include Cover Letter Builder, which provides templates and sample phrases, providing you with a high quality and professional cover letter simply by filling in the blanks with your individual details. Another option is Smart Cover Letter which allows you to select job-specific templates, and supplement them with your own information. 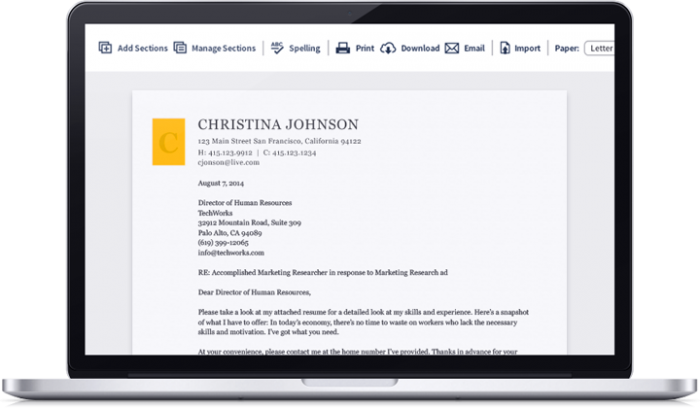 This means you can quickly produce multiple cover letters, all tailored to specific jobs. It’s also worth noting websites such as Australian Help , Big Assignments or UK Writings which provides numerous writing tools, helping to ensure you use the right style, format, and have excellent spelling and grammar. Their writing resources can be invaluable when writing a cover letter that you hope will help you make a great first impression. If you feel that you are the perfect candidate for a position, but have the self-awareness to know that writing is not your strong point, then why not outsource your cover letter? Jobs in mathematics, IT, and engineering rarely actually require strong written communication, as they’re more technical, and an entirely different skillset. So why not hire a talented writer, who can express why you are the best person for the job? The people at Boom Essays, and are all highly educated, and excel at formal writing. You can tell them everything they need to know to produce a factually accurate cover letter, relevant to the job you are applying for. And while this can be a great help with the cover letter, the next step, writing your resume, can be taken care of by the experts at Resumention. All of these services are confidential, and will only be handled by experts, who know exactly what employers are looking for. Considering all of the information and support available on the internet, there is absolutely no excuse for writing sub-standard or poor quality cover letters or resumes. From help with written skills like spelling or grammar, to knowing what your cover letter should look like and the information it should contain, everything you need is out there. The websites listed above include absolutely everything you need to produce applications that will have the job offers rolling in in no time at all.